#12-17 "A Mind for Pool" (Left) A handy reference to everything about the mental side of billiards play. Shows how to eliminate mental mistakes. Sections on playing under pressure, troublesome opponents, and on adapting to adverse conditions. 304 pages, about 7 inches wide, 10 inches tall. 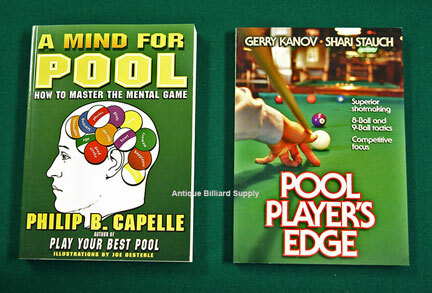 $50, "Pool Players Edge" (Right) Important reading for anyone serious about pool. Describes advanced techniques and tactics to help out-play and out-think the competition. Discusses game strategy and how to control the table. 218 pages, about 7 inches wide, 10 inches tall. $35.